The Institute for Molecular Science has stablished a fruitful collaboration with scientific comic artist Miriam Rivera-Iglesias (@miriamriig). We aim to make the research of the ICMol –recently recognized as a MarÃ­a de Maeztu Unit of Excellence- accessible to a wider public. The first comic created by Miriam in this framework illustrates several research lines at the ICMol by following the steps of a little molecule. Initially marginalized by conventional materials, her arrival to our Institute allows her to discover her unsuspected abilities, as well as the abilities of the companions she finds in this molecular world. 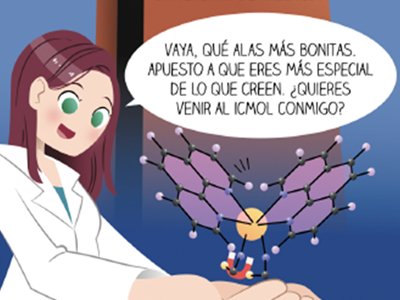 For its preparation, the comic required the involvement of several researchers of the ICMol on top of independent bibliographic research by @miriamriig. It has been simultaneously edited in English, Spanish and Valencian. 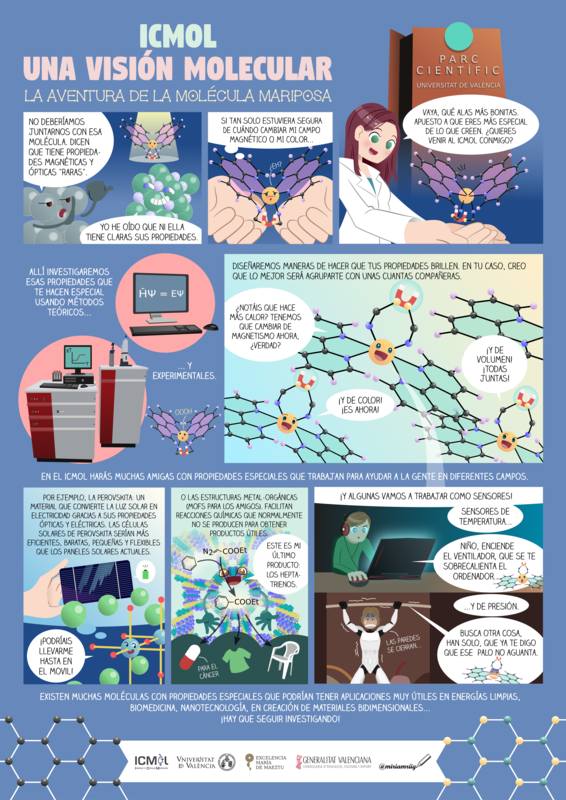 @miriamriig, with a degree in Human Biology and a Master in Scientific Communication, works as a scientific outreach professional preparing scientific comics and infographics. Like in the present case, she tends to integrate a narrative into the comic to stimulate the cognitive processes necessary for understanding and recalling the scientific content that is presented. Her easily recognizable drawing style, sensibility and sense of humour allows a wide range of complex concepts to be presented to the public in a clear and understandable way.